The latest of Netflix’s original films (and, arguably, the most interesting one) is streaming worldwide, so, let’s talk about it. This is the review of Death Note. IMDb summary: Light Turner, a bright student, stumbles across a mystical notebook that has the power to kill any person whose name he writes in it. Light decides to launch a secret crusade to rid the streets of criminals. Soon, the student-turned-vigilante finds himself pursued by a famous detective known only by the alias L.
2017’s Death Note is a live-action adaptation of a beloved anime/manga franchise. The Netflix’s version of this IP has been called the ‘American adaptation’ with the hopes of stopping or minimizing the criticism on the topic of whitewashing. Weirdly, I haven’t seen the same argument being used to defend Ghost in the Shell. Also, I find it strange that, in this day and age, somebody would make a movie purely for the American audience, when it is definitely gonna be seen all over the globe. Death Note’s script was written by Charles Parlapanides and Vlas Parlapanides (the duo behind 2011’s Immortals – a Henry Cavill pre-Superman film), and Jeremy Slater (who wrote, oh no, 2015’s Fantastic Four). Going in line with the idea of Americanization, the screenwriters efficiently grounded the film’s story in an American life by opening the movie with the sequence set in a stereotypical American high-school. This was a first and a very obvious change from the original material. As I’m not familiar with neither the original Death Note anime or manga, I’d be interested to find out what other changes occurred? How were the characters different (excluding the race switch)? How much of the original plot-points were retained? Were the changes made because of the Americanization or for some other reason? The picture still did have some Japanese elements (mainly two: the word ‘Kira’ and its meaning remained and a few minor Japanese characters were involved in the narrative). Speaking about the fantasy part of the story – I found it very fascinating and now I get why every anime fan loves Death Note. I thought that the film set up the mystical side of its story very well, although Light’s transition into being the full-on Kira figure was a bit sudden. Nevertheless, I did like that the movie raised questions about the vigilante justice (on a massive scale) and questioned the limits that some people might be willing to push past. Other, more real-world-related topics, which were touched upon in the film, were bullying, anti-socialness, and the unproductive parent-child relationships. As the narrative is usually made or broken by its characters, let’s discuss them. I very much enjoyed the writing for Light. I loved how smart he was and, yet, how he still made stupid mistakes appropriate for his age (like telling his girlfriend about the book, although, I’m quite happy that the scriptwriters allowed him to ‘show and tell’ rather than act like Iron Fist, who only tells his story without any proof and expects others to believe him). Light’s opposite and equal – L – was also quite nicely realized. I loved the fact that the stand-off between these two was happening on a whole other level of brilliance. Their genius-ness could be seen in 1)L’s initial detective skills and 2)Light’s ability to avoid culpability in the end. I also liked how the main difference – one’s readiness to kill and other’s refusal to, was highlighted in the movie. Another important character in the film was Mia, Light’s girlfriend. The writing for her was the worst, mostly because the secrets and the reveals, related to her, were fairly obvious. However, I noticed an interesting parallel between Death Note’s notebook having an influence over Mia similarly to how Tom Ridley’s diary had a hold on Ginny in HP2. Adam Wingard directed the 2017’s Death Note and did a good job. His previous work mostly belongs to the horror genre and it looks like he brought elements of it to Death Note too and turned the psychological thriller/detective thriller into more of a horror film. He did that by using plenty of jump scares and really gruesome and gory violence. The graphic content didn’t detract from the plot but it didn’t add to it either. The final product also definitely had a feeling of a Hollywood film, due to its soundtrack (by Atticus Ross and Leopold Ross) and all the slow motion (so the Americanization of the property continued from the script into the visuals and the sounds). The character design of Ryuk was quite good. He looked terrifying enough and kinda reminded me of the clown in the new IT film. I applaud the filmmakers for using mostly practical effects – puppets and costumes -to bring this character to life (CGI was only used for the face). I’ll comment on the look of the other characters in the acting category. Lastly, the 3rd act of the film was quite strong. The final chase (L going after Light) was neatly paced and I liked its instrumental score and the urban setting. The ferry’s wheel sequence was also exciting and entertainingly crazy, especially when all the characters came clean. The director’s next project is Godzilla vs. Kong for Legendary’s MonsterVerse. Nat Wolff was really good in the lead role of L. He played the lead character as a psychotic but vulnerable genius.Wolff is slowly building his career, he first popped on everyone’s radar with a small part in The Fault in Our Stars and later starred in the John Green follow-up movie Paper Towns. L was played by Lakeith Stanfield. The actor had previous small roles in Selma, Straight Outta Compton and Get Out (which I’m going to review in a couple of days). The idea to cast an African American actor in the role added some diversity and accuracy for a US-based film. Still, I don’t think that this type of diversity can work as an apology for not casting Asian talent in any of the lead roles. And yet, while the character did not retain neither its original race nor the iconic hair, his sitting position remained the same, which was a nice. Also, if we take the character’s look on its own and don’t compare him to anyone else, I have to admit – L did look very cool . Mia was played by Margaret Qualley (The Nice Guys). I thought that she was the weakest of the cast. Her character’s shadiness was very obvious, presumably because the actress performance lacked subtlety. Willem Dafoe voiced and did the facial expressions for Ryuk. His voice fit the character neatly and the facial expressions were sinister enough. In brief, Death Note was an okay adaptation of a beloved anime (but honestly, the bar has been set pretty low by Ghost in the Shell). Whitewashing aside, the film had a couple of writing problems, but, in general, was enjoyable. So, the time has come to review the last comic book movie of this summer and probably the most disappointing one. Let’s go meet the not so fantastic Fantastic Four. To begin with, Fantastic Four is actually the first comic book that I have ever read. I also loved the animated series when I was a kid. Even though comic books were not popular in Eastern Europe when I was little, everybody seemed to know who the Fantastic Four were. Lastly, back then I even thought that the 2005 and 2007 movie editions were not that bad. Of course, I changed my mind when I re-watched them only recently. Because of that, I had really high hopes for the reboot. I was hoping that they would get it right this time or that I at least would like it with only a singular watch. Let’s be real – a lot of movie crumble on a closer inspection. But this one doesn’t even need a closer look to come across as really really bad. Let’s get on with my angry rant. IMDb summary: Four young outsiders teleport to an alternate and dangerous universe which alters their physical form in shocking ways. The four must learn to harness their new abilities and work together to save Earth from a former friend turned enemy. 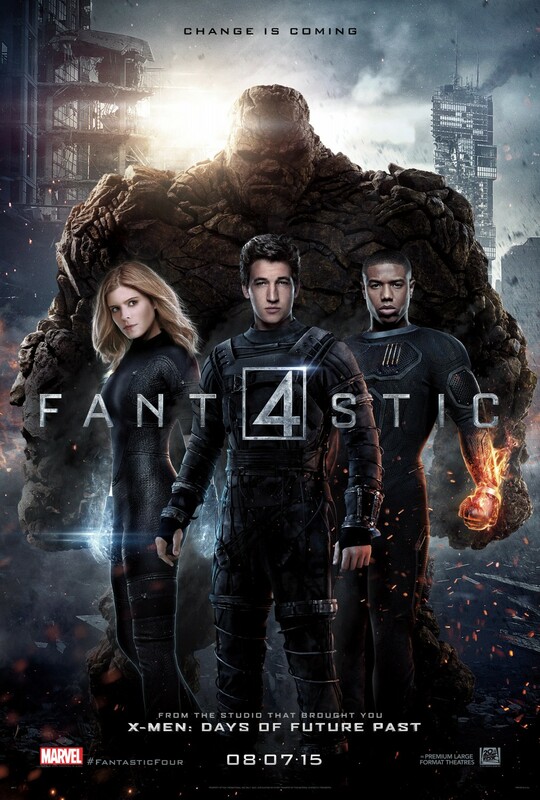 To begin with, this movie is based on the Ultimate version of the Fantastic Four, so the origin story is a bit different. Also, the movie tries to make the story as realistic as possible by relying on scientific explanations. I was really excited that they decided to adapt the Ultimate version because I always enjoy seeing something fresh and unique. Moreover, science fiction has been one of my favorite genre of films since childhood, so I was down for some extraordinary science mambo-jumbo. The thing I wasn’t down for – the Fox studios getting my hopes up after the X-Men Days of Future Past (review) and then crushing my trust in them completely once more. Deadpool please be good. I am begging you. The film is directed by Josh Trank and written by Jeremy Slater, Simon Kinberg and Trank himself. Although, it seems like Fox executives were also involved in the production a lot and their fingerprints are defintely showing. And when the money-driven studio gets in a way of the actual creators, nothing good ever happens. The movie had tremendous potential and it wasted all of it. The story was okay during the first half, but the ending was terrible. The time jumps made zero sense. The dialogue was cheese and uninspiring as well as full of cliches. The only scene with some interesting dialogue was the one right before they decided to travel to the other dimension and were all drinking in the circle. The Neil Armstrong argument was the best line in the whole film. Sadly, it was short and lasted for just a minute. After that, you had to sit through 100 minutes of awfulness. In addition, all the character were undeveloped, they never picked a clear main protagonist and tried to develop all of them, but just failed completely. It felt like the movie was missing half the scenes, which probably contained the backstory. Plus, the villain was the most awful of all the characters. They completely ruined Doctor Doom. Also, they didn’t include Sue Storm in the actual experiment that gave them powers but she still got hers anyway. You have one female character, only ONE, and you mess her story up? How is that even possible?? Moving on to the action scenes – there was only like 2 of them. One of them is okay, the other makes no sense. And the CGI…oh God. With the movie that cost this much money and is being made in 2015, you would expect at least the computer effect to look great, but they don’t. It looked like this film was made in the late 90s or early 2000s by some kid in a garage. Basically, it was a cheap looking animation. The only effects that looked quite good were the actual powers of the Fantastic Four. The Thing’s design was okay, but Johnny’s flaming body was the coolest one for me. However, Reed’s stretching abilities were enhanced by allowing him to change his appearance and that scene looked awful. Furthermore, when Sue Storm was flying in her force field bubble, you could clearly spot the places where the cables were attached to her back. This movie had an extremely talented cast, who kinda lost their talent while filming. I’m guessing the terrible script made them loose all inspiration to perform. Miles Teller as Reed Richards / Mr. Fantastic. I am a huge Miles Teller fan. I praised him in a separate blog post. But here, he was not that great. He definitely portrayed the nerdy aspect of the character perfectly as well as was a great half-of-a-friendship with Ben, but he was awful as a team leader. His inspiring monologue was so corny and so bad. Michael B. Jordan as Johnny Storm / Human Torch. I have no idea why the fans got angry when they changed the race of Johnny Storm. It looks like we are still living in the 19th century with all the racism and discrimination that is going on. I never look at a skin color of the character or an actor. I look at their work and the way they present themselves. I really loved Michael B. Jordan in That Awkward Moment and enjoyed his performance here. He was probably my favorite character and, to my mind, did the best job out of all of the cast. Kate Mara as Susan “Sue” Storm / Invisible Woman. I have already complained about the creators decision to not include Sue in the actual experiment. Also, once again they made her into an unlikable and not fun mommy type character. It’s not the 1940s!! If you are changing the backstory and the personality of the character, change it for the better and not for worse. Jamie Bell as Ben Grimm / Thing was quite good. He definitely portrayed the sadness and inner anger of the character well. However, he lacked developed and closure to his story like the others. Toby Kebbell as Victor von Doom / Doctor Doom……Don’t even want to talk about him. This was not Doctor Doom. He looked weird, his power were weirder and his intentions and actions – weirdest of it all. Reg E. Cathey as Dr. Franklin Storm. Fox tried to turn the daddy Storm into Professor Xavier of the X-Men or Nick Furry of the MCU. Not surprisingly, Fox failed. Moreover, the supposedly inspiring monologues were terrible. Tim Blake Nelson as Dr. Harvey Allen. He was as suppose to be the unlikable antagonist of the Fantastic Four. However, since you didn’t really care for the heroes, you didn’t hate the anti-hero either. The government story-line and the militaristic ideas, introduced through this character, were interesting, but the movie never followed up on them. This move didn’t even had a Stan Lee cameo. Seeing Stan always makes the movie better for me, but Fantastic Four didn’t even have that. The only reference which I’ve enjoyed was the Star Trek’s ‘Beam me up, Scotty‘, when the kid Reed Richards was talking about teleportation in the class. That, I though, was clever. To sum up, the Fantastic Four film took itself way too seriously, it never found a clear direction or a tone. It was way to uneven and a few good performances and interesting lines only reminded us, how good the movie could have been but wasn’t. I don’t believe it will get a sequel. I’m hoping it won’t.